Planning to have a Party? We Are Available for Girls Night Out Parties,Holiday Parties, Demos, Festivals, Performances, Reunions, Birthdays, Weddings, Showers, Wine-Tasting, Grand Openings, Luaus, Fiestas, Mardi Gras, Carnivals, Sweet 16, etc. 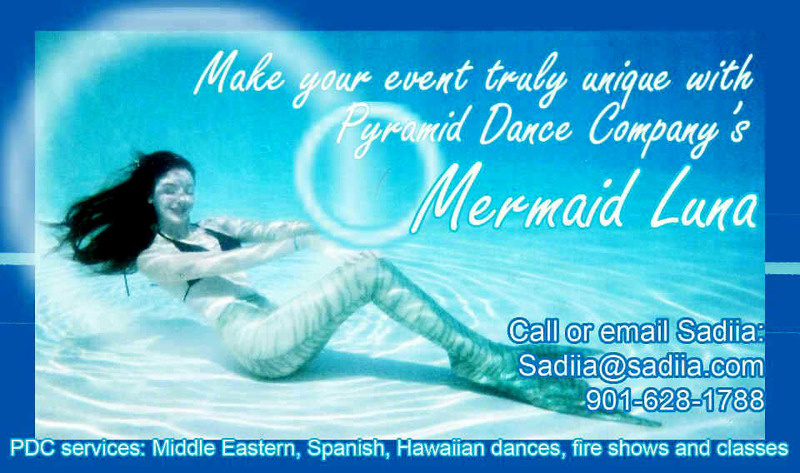 We have Belly Dancers, Hula Dancers, Spanish Fiesta, Gypsy Dancers,Mermaids, Pirates,Fire Eaters, Magicians, Fortune Tellers, etc. We perform at Children's' and Grown-Up's Theme Parties, as well as quick Belly-Grams for a birthday surprise (15 minute show & includes getting the recipient up to learn some belly dance moves); or a Harem Party for Ladies' Groups (includes a dance demonstration & class, hostess gift, discount coupons); and Professional Stage shows. We provide the best in quality and price. We are rated as PG family entertainment (no Bachelor Parties, please)Gift Certificates Available. Contact Sadiia at (901) 628-1788 or email to schedule. Arabian Night Party at Arabesque. "Sadiia, The event was a happening thanks to your dancers, their talent and their professionalism. Alexandra, Serena and Larena were wonderful in helping us. The guests fell in love with Larena's graceful dancing. Her movements came across fresh and genuine, she was superb. Thank you for your help in making our party the memorable event it turned out to be for everyone there!" "I must compliment you on your choice of girls to send to my friends party. Leila was incredible!!!! She was so sweet to everyone and she made all the guys eyes pop out (ha ha). I will recommend your dance company to everyone I know!" "I wanted to thank you and Larena for an awesome birthday gift for my son yesterday. He was having a very bad day, but he quickly got out of his bad mood once she started her dance. Larena was absolutely wonderful in her personality, in her dance and - well, we just loved her! She even got my son, the non-participater, to get up and try to bellydance. He had a great time, it was a wonderful surprise, and well worth the money. I will definitely recommend your business to everyone I know for future services. Thanks again for your help in making my son's 21st birthday a real hit! Also, please pass on our appreciation and thanks to Larena." Sincerely a fan, Toya R.
"I just wanted to let you know that the dance for the Greek dinner was a great success and that Jamila did a great job. Having the belly dance at the dinner elevated the event to a truly memorable experience for everyone. She even got all of the ladies up for a few dances. We will be having another Greek dinner in the near future and I am sure we will want a dance as part of that event as well." "I know it is a long time coming, but I am writing to extend my sincerest gratitude for your hospitality, excellent customer service, hard work and assistance. We bellydanced, sipped on Sangria's, and feasted on Moroccan Cuisine that made our mouths water....It was the best bridal shower EVER, with the help and support from you. Your efforts have not gone unnoticed and they made this event a dream come true for me, the guests of the bridal shower and, most importantly, my friend Kathy on this past April 15th 2006"
"Awesome!!!! You have a very classy group of ladies, and I enjoyed them as well as everyone else. I will definitely get with you in regards to our next affair."